Guardzilla 360 is the first-ever all-in-one security and monitoring system on the market that delivers full 360-degree live HD viewing and motion detection capabilities. ST. LOUIS, MO--(Marketwired - Nov 9, 2017) - Guardzilla; a leader in affordable, HD WiFi security cameras that enable customers to monitor and protect their homes inside and out from their smartphone, today announced its newly introduced Guardzilla 360 video monitoring system has been named a CES 2018 Innovation Awards Honoree. The product is the first-ever all-in-one security and monitoring system on the market that delivers full 360-degree live HD viewing and motion detection capabilities. To experience the power of the Guardzilla 360's full panoramic video monitoring right on your smartphone, follow the Guardzilla 360 Demo instructions below. Unlike typical WiFi video security systems that offer a very limited 130-150 degrees of view and protection, the Guardzilla 360 provides a live 360-degree field of view, 360-degree night vision, and 360-degree motion detection with instant phone alerts. The new system also features breakthrough communication features including a built-in microphone and speaker that enables two-way conversing with friends and family (vs. the one-way walkie-talkie communication other security cameras utilize) through the Guardzilla app, and three programmable call buttons for instant push notifications to smartphones (e.g. mom, dad). The Guardzilla 360 also offers a 100dB alarm to deter intruders and geo-fencing capability, so users have the option to automatically arm or disarm the system when their smartphone is detected exiting or entering the geo-fence perimeter. "It is truly an honor to be recognized as one of the few recipients of this award, particularly in the highly competitive and innovative Smart Home category," said Terry Bader, Chief Revenue Officer at Guardzilla. "The Guardzilla 360 is literally a game-changer in the home security industry, giving users the ability to see and communicate with their entire environment from their smartphone, while also providing an unprecedented suite of security features, all in real time." Products entered in the prestigious CES Innovation Awards program, sponsored by the Consumer Technology Association (CTA), are judged by a panel of independent industrial designers, independent engineers and members of the trade media. Their mission is to honor outstanding design and engineering in cutting-edge consumer electronics products across 28 product categories. Entries are evaluated on a set of guidelines including the product's engineering, aesthetic and design qualities, intended use/function and user value, unique/novel features present, and how the design and innovation of the product directly compares to other products in the marketplace. Members of the press can see and experience the Guardzilla 360 system at the Pepcom Wine, Dine & Demo press event on Thursday, November 16 in New York City. CES 2018 Innovation Honoree products are also featured by visiting www.CES.tech/Innovation. Guardzilla will be demonstrating the Guardzilla 360 at Pepcom Digital Experience in Las Vegas on January 8, 2018 at the Mirage Hotel. To experience the amazing power of 360-degree viewing and security on your smartphone, text '360' to (833) 360-3366. Within seconds you will receive a text reply which includes a link to an interactive video demo that will showcase the impressive Guardzilla 360. Once you've opened the link, please hold your smartphone horizontally for the optimal user experience. 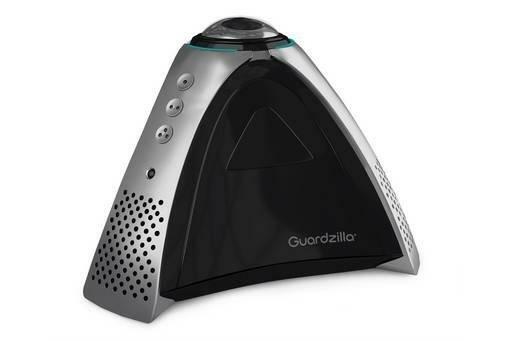 Guardzilla 360 is available today at a $229.99 MSRP, online and in-store from leading retailers across the country including WalMart, Best Buy, Target, Office Max, Staples, and Home Shopping Network. Founded in 2014 and based in St. Louis, Guardzilla, a WiFi security and home monitoring company, was established to break the barrier that kept homeowners and renters from protecting their loved ones and property due to the high installation cost and onerous monthly fees security companies charge. Individuals can monitor and protect family members, pets, their home and small business with Guardzilla's easy-to-use, affordable, and customizable security systems that stream video to user's smartphones in real time. For more information, please visit our website at www.guardzilla.com, and follow us on Twitter and Facebook.